Cluster headache (CH) has the dubious distinction of being the most painful disorder known to humankind: topping cancer, broken bones, childbirth and third-degree burns1 and has been referred to as the suicide headache because suicidal ideation occurs in 55% of patients (Case).2 The International Clasification of Headache Disorders, 3rd edition (ICHD-3) describes CH as side-locked, periorbital pain lasting 15 to 180 minutes, with autonomic features such as ptosis, nasal congestion, and a bloodshot eye.3 Fortunately, CH is uncommon, striking an estimated 0.1% of persons in the US.4 Approximately 17% of patients with CH (~1 in 6) have the chronic variant, with no break in the unrelenting attacks. To say that chronic cluster is the worst version of the most painful condition known only begins to hint at the agony. The term suicide headache is so often repeated it risks sounding cliché but not for Glenn R. A soft-spoken middle-aged machinist, 2 years ago Glenn, despite having no background in firearms and no previous desire to use guns, completed the firearm safety course and bought a semiautomatic handgun. Married to his high school sweetheart with 2 young kids and a job that paid the bills, Glenn had few complaints, but he needed a way out. The word headache, as it applied to the horror that visited him in the darkest hours of each morning, was a joke. This was no headache. It was hell on earth, the worst torture imaginable, a beast within: a suicide headache. Glenn’s first 2 attacks of what he learned were cluster headache had him arrested. When the first one struck, he was drinking tequila, bumming smokes, and celebrating a coworker’s recent nuptials. When his left eye exploded he was gobstruck; sweating, panting, pacing like a caged animal, he swung his arm like a wrecking ball into a mirrored wall, shattering glass and prompting a call to the police. In the squad car, he writhed, handcuffed and tearing. Intoxication with PCP was suspected, and in the emergency department, after his belt and shoe laces were confiscated, he waited in a padded room. The terror abruptly ceased 90 minutes after it began. Confused, labs devoid of illicit substances and head CT results normal, Glen was discharged, with neither instructions nor follow-up. At 2:11 the next morning. the beast returned. Glenn screamed, rocked back and forth, and slammed his head into the headboard repeatedly. His panicked wife dialed 911. This time, a neurology resident—who was admitting a stroke patient when Glenn was brought in—saw 3 security guards whisk an agitated, handcuffed guy the size of a side of beef past her. She noticed the drooping right eye, the tearing, and the bloodshot iris. She stopped what she was doing, asked the nurse for sumatriptan, 6 mg, stat, and followed Glenn into the padded room. Glenn found a headache specialist and for 9 years, he could manage the cluster headaches that struck twice a year. If he jumped on verapamil, prednisone, and occipital nerve blocks at the start of a cycle, got his insurance to cover high-flow oxygen, and finagled enough injectable sumatriptan, he could fight the beast for a month or so and beat it down. Eventually, 3 years later and 12 years after the first headache, Glenn’s treatment plan stopped working and chronic cluster headache set in. The suicide headache came to stay. The medicines stopped working. A coworker suggested marijuana, but that intensified the pain. Glenn tried 20 or more pills, and all types of alternative treatments, but nothing worked. Desperate and hopeless, he concluded the gun was the only option left. There is high-quality evidence for use of sumatriptan injection, zolmitriptan nasal spray, and high-flow oxygen inhalation to treat patients with acute CH. For preventive treatment, there is less evidence. Although ipsilateral occipital nerve block alone is an American Headache Society (AHS) level A recommendation,5 high-dose verapamil is the most commonly used preventive; lithium and topiramate remain mainstays, despite inadequate evidence. 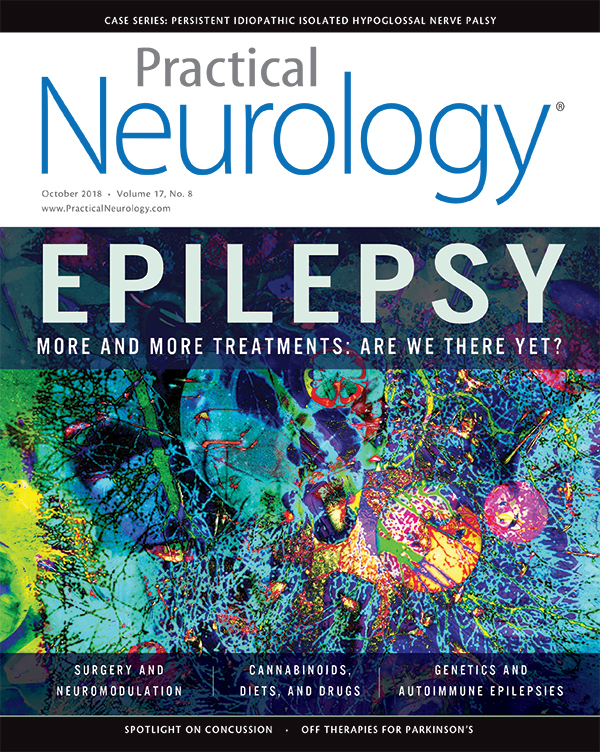 Newer therapeutic options include neurostimulators (eg, noninvasive vagal nerve stimulator [VNS] [Gammacore; Electrocore, Basking Ridge, NJ] shown effective for episodic CH or an investigational implanted sphenopalatine ganglion [SPG] stimulator [Pulsante; Autonomic Technology, Mountain View, CA] for acute treatment of chronic CH). Monoclonal antibodies to calcitonin gene-related peptide (CGRP) are also being studied for the treatment of patients with CH and may have efficacy in prevention of episodic but not chronic CH. More than 25% of patients with CH find that neither medicines, nerve blocks, oxygen, nor neurostimulators work for the crushing, unrelenting agony of this most painful of all maladies. A sizable subset of these patients, driven to the brink of suicide, will go to any length, including taking an illegal substance that may risk their health, job, and freedom, to break free of the torment that is CH. Increasingly, patients with CH are turning to psychedelics (eg, lysergic acid diethylamine [LSD] or psilocybin), and treating themselves with hallucinogenic substances, although often in subhallucinogenic doses. For a variety of reasons, they may not be forthcoming with their headache specialist about this. It is therefore incumbent upon neurologists and others who treat patients with CH to know that what is termed busting, treating CH with psychedelics, is widely known, well-accepted, and frequently practiced by those with CH for whom all else has failed. Psilocybin is a naturally occurring hallucinogenic tryptamine similar to LSD, found in over 180 species of small, nondescript mushrooms in the psilocybe family.7 For millennia, indigenous people throughout Mexico and Central America have consumed these in religious ceremonies. Albert Hoffmann isolated pure psilocin (the active metabolite of the prodrug psilocybin) in 1963. Both LSD and psilocybin were studied for treatment of people with a number of psychiatric conditions, including severe depression, alcoholism, and posttraumatic stress disorder throughout the 1950s and 1960s.8 Then came the Age of Aquarius, counter-culture, and Timothy Leary, a Harvard psychologist who encouraged widespread recreational use of psychedelics, urging his followers to “turn on, tune in, and drop out.” Federal authorities, reacting to a perceived drug epidemic, outlawed both psilocybin and LSD, designating each a schedule 1 substance: meaning high abuse potential and no proven medical value. The ring structure of LSD is similar to ergotamine-based headache-relieving compounds such as methylergonovine and methysergide, and psilocin is chemically nearly identical to serotonin.12 Sumatriptan, a sulphonated indole, is structurally similar to the hallucinogen dimethyl tryptamine (DMT). Like psilocybin, DMT has been used in religious ceremonies for centuries; when DMT is combined with a plant-based monoamine oxidase inhibitor (MAOI), it is called ayahuasca. Because DMT is often inhaled rather than ingested, peak plasma concentrations are reached in seconds. The similarities in biochemistry make it unsurprising that indolamines (eg, ayahuasca, DMT, D-lysergic acid amide [LSA], LSD, psilocybin, and the nonhallucinogenic 2-bromo-LSD [bol-148]) are anecdotally reported to have efficacy for treating people with CH.13 Social media has raised awareness of this and even somewhat of a rush of desperation by patients with CH toward psychedelics for relief. Bob Wold, who had CH for 30 years, experimented on himself with great success and founded the nonprofit Cluster Busters in 2002 with the goals of spreading the psychedelic gospel. Glenn learned about psilocybin-containing mushrooms from an online chat room, and he credits them with saving his life. Although he drank a little tequila before his clusters became chronic and smoked some marijuana in high school, Glenn was a pretty straight arrow. He read articles describing how hallucinogenic doses of LSD cured refractory alcoholism; learned that Bill Wilson, founder of Alcoholics Anonymous, credits his sobriety to a life-changing experience with LSD; and saw a New York University study on how use of psilocybin helped terminal cancer patients overcome crippling existential fear of death. Still, the idea of tripping held no appeal for Glenn; instead, like most patients with CH, he decided to microdose. A simple guy, he just wanted the beast contained, and despite buying the gun, Glenn really wanted to live. Glenn’s first dose was a nonhallucinogenic 500 mg of mushrooms chewed into a bitter pulp and swallowed. That day and the next he was pain free for the first time in years. He took another dose 2 days later and had a delicious 5-day run of pain freedom, and although he did have an occasional shadow—a livable dull bruise around his eye—he had no tearing or eye droop, and no need to bash his arm into a wall. Through trial and error, guided by online resources, Glenn worked out a regimen of 500 mg of mushrooms twice a week at the onset of a cluster cycle (miraculously, his clusters had reverted back to episodic) for 2 weeks. If that didn’t abort the cycle altogether, he took another 250 mg twice a week for another month. He found he could usually stop at that point and the cluster cycle would end. Glenn discovered he enjoyed shooting the gun, but not at his head, and he joined a local gun club where he teaches the firearm safety course once a month. When I last saw him, he was feeling well. His daughter had married a few weeks earlier. He visibly choked up when describing his desperate plan with the gun, and how he never would have experienced his daughter’s wedding had it not been for microdosing with psilocybin-containing mushrooms. I recently gave a lecture to the Cluster Headache Support Group at their annual conference in Philadelphia. In addition to covering neuromodulation and CGRP-related treatments, I spoke about psychedelics. I asked attendees to chat with me afterwards and heard story after story of heart-breaking pain dramatically reduced or eliminated by psychedelic compounds. I left convinced that there is just no good reason why these treatments remain illegal for those with CH. To deprive someone suffering this degree of pain a treatment that, while clearly inadequately studied, appears safe and effective, seems cruel. As with all medicines, when discussing hallucinogens as treatment modalities, caveats abound, and these substances are not for everyone. I would include on a no-fly list: children, pregnant or lactating women, and those with pre-existing significant medical or psychiatric disease, pending further studies if we are ever allowed to do them. As is also true of typical medicines, psychedelics are neither panacea nor cure. Anecdotally, some patients with CH report no benefit, while a small group appears to feel worse.16 Clearly, there is much work to be done. We need, on behalf of all those suffering from the suicide headache, rigorous double-blind, placebo-controlled studies to properly determine efficacy, dosing, side effects, and safety. Patients experiencing the excruciating pain of chronic CH are often desperate, and the lack of well-designed clinical studies is not enough to stop them from trying something—anything—that might end the pain. The patient we describe here has all the evidence for efficacy he needs: walking his daughter down the aisle. For the countless other patients out there, let’s hope (and advocate) for loosening of restrictions on research into psychedelics, by demoting them to a DEA schedule that will better allow proper research. Then, armed with knowledge derived from rigorous study, and legal access to psychedelics in microdoses, we may one day finally tame the beast, and the suicide headache will be no more. 1. Cicero K. The 10 most painful medical conditions. Prevention.com. Published Dec. 12, 2014. https://www.prevention.com/health/a20486144/top-painful-medical-conditions/. Accessed September 4, 2018. 2. Rozen TD, Fishman RS. Cluster headache in the United States of America: demographics, clinical characteristics, triggers, suicidality, and personal burden. Headache. 2012; 52(1):99-113. 3. Headache Classification Committee of the International Headache Society. International classification of headache disorders. Celphalgia. 2018;3(1):1-211. 4. Fischera M, Marzinak M, Gralow I, Evers S. The incidence and prevalence of cluster headache: a meta-analysis of population-based studies. Cephalalgia. 2008;28(6):614-618. 5. Robbins MS, Starling AJ, Pringsheim TM, Becker WJ, Schwedt TJ. Treatment of cluster headache: the American Headache Society evidence-based guidelines. Headache. 2016;56(7):1093-1106. 6. Hagenbach D, Werthmueller L. Mystic chemist: the life of Albert Hoffman and his discovery of LSD. Santa Fe, NM; Synergetic Press: 2013. 7. Wasser S. Species diversity of the genus psilocybe (basidiomycotina, agaricales, strophariaceae) in the world mycobiota, with special attention to hallucinogenic properties. Int J Med Mushrooms. 2005;16(1):305-332. 8. Szalavitz S. LSD may help treat alcoholism. Time. http://healthland.time.com/2012/03/09/lsd-may-help-treat-alcoholism/. Published March 09, 2012. Accessed September 4, 2018. 9. Nichols D. Hallucinogens. Pharmacol Rev. 2014;101(2):131-181. 10. Raichle M, MacLeod AM, Snyder AZ, et. al. A default mode of brain function. Proc Natl Acad Sci USA. 2001; 98(2):676-682. 11. Carhart-Harris R, Muthukmaraswamy S, Roseman L, et. al. Neural correlates of the LSD experience revealed by multimodal neuroimaging. Proc Natl Acad Sci USA. 2016;113(17):4853-4858. 12. Furst PE. Mushrooms: Psychedelic Fungi. In Snyder SH. The Encyclopedia of Psychoactive Drugs (series). New York, NY: Chelsea House Publishers; 1986. 13. Ginzel KH, Mayer-Gross W. Prevention of psychological effects of d-lysergic acid diethylamide (LSD 25) by its 2-brom derivative (BOL 148). Nature. 1956;178(4526):210. 14. Sewell RA, Halpern JH. 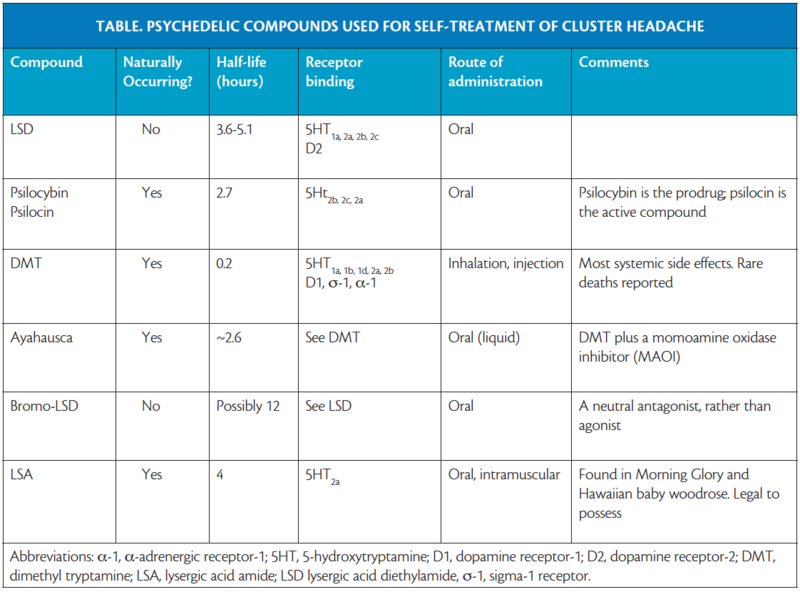 Response of cluster headache to psilocybin and LSD. Neurology. 2006;66(12):1920-1922. 15. ProCOn.org. 30 Legal medical marijuana states and DC: laws, fees, and possession limits. https://medicalmarijuana.procon.org/view.resource.php?resourceID=000881. Updated July 28, 2018. Accessed Septemer 4,2018. 16. Persson M, Kjellgren A. Psychoactive substances as a last resort—a qualitative study of self-treatment of migraine and cluster headaches. Harm Reduct J. 2017;14:60.